If you are willing to make a donation sometime in future, or making a periodic (monthly, quarterly, yearly) donation - please take a moment to fill up this form - this will help us plan our activities better. The iconic “Do Choti” (english - ‘Two Braids’) of the school going girl, smiling, hopping there way to school, helping & caring for all, and spreading happiness, they are adored by all be it elderly or young. “Do Choti”(english - ‘Two Peaks’) also represents two peaks (of the mighty Himalaya). Two peaks with a rising sun between them. 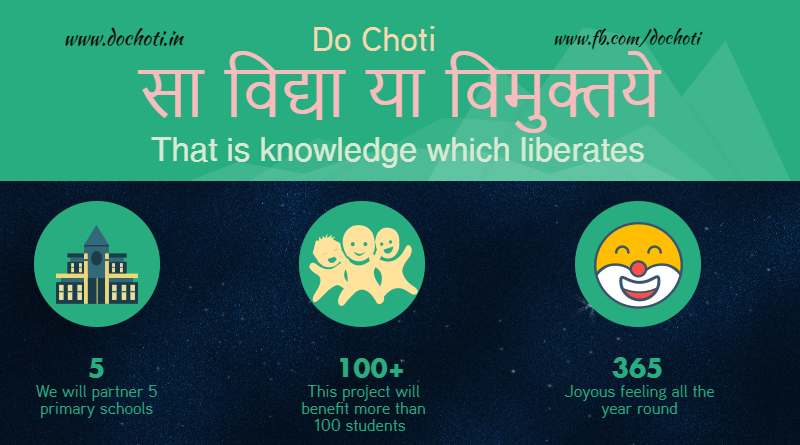 We at “Do Choti” endeavor to spread the message to be as the rising sun; the modern age Prometheus; empowering masses - rising, shining, showering its pleasant warmth and light everywhere, while being as humble and loveable as the school going girls with “Do Choti” . Project “Nantin” that aims to motivate the children going to primary schools and create a favorable environment for them. We wish to provide add on facilities to the kids attending the Govt. primary schools and “Satat Shiksha Kendra”.